Started Pullets are hens that range from 15-22 weeks old. You can purchase any number of started pullets - even just one. Most hens start laying eggs at 24 weeks. So once they arrive and become accustomed to their new surroundings, they will shortly begin to lay eggs. The feathers on a Barred Rock, are black with white barring throughout. Barred Rocks are known as American's oldest dual purpose, heritage breed, used primarily for excellent production of large brown eggs even in the summer heat. The New Hampshire was developed around 1915. 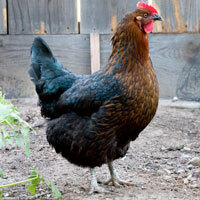 A very popular dual purpose breed that grows fast, feathers quickly and produces large brown eggs. The body and chest color are a beautiful, medium chestnut red. The males are somewhat darker than the females. Red Star Pullets are production quality pullets raised on pasture and all natural feed. Our pullets will start laying at 23 weeks of age or earlier. Uncle Bob will only eat white eggs. This is the breed for him. These are our very best white egg layers. If you are after maximum production of white eggs with the most efficient feed conversion ratio, then this is your ticket. A Rhode Island Red has a lustrous rich dark mahogany red with a dark tail. These pullets are one of the best dual-purpose breeds and a super choice for back-yard flocks. The birds are hardy and do excellent in a free range operation though they will also do well in confinement. They are a wonderful choice for production of large brown eggs at around 24 weeks of age. The Araucanas/Ameraucanas are known as the "Easter Egg Bird," in multi-colored mixed white, brown, red and blacks these birds are characterized as having fluffy ear muffs. Famous for their blue and green eggs, Araucanas/Ameraucanas, are wonderful egg producers and have an impressibly long laying season; and are able to withstand hot and cold climates. The Orpington breeds were developed in the 1880s. The Buff Orpington, is a well known breed with a rich, outstanding golden buff color. These large quiet dispositioned friendly birds have been a back-yard flock favorite for many years. They are also one of the most broody among the standard breeds and are excellent mothers and do great with children. With a feather pattern very similiar to the Silver Laced Wyandotte, the Golden Laced Wyandotte is a beautiful bird. As a large brown egg layer, they are beautiful to watch in a backyard flock. Developed by Dr Tom Whiting to lay a consistent blue egg, these birds have a wide variety of feather patterns and coloration. Developed by Dr Tom Whiting to lay a consistent green egg, these birds have a wide variety of feather patterns and coloration. A nice well behaved large brown egg layer, the Columbian Wyandotte makes an attractive addition to your backyard flock. Get a jump start on your eggs with our Black Star pullets. These hens are shipped at 15-22 weeks of age. They will start laying nice wonderful brown eggs at around 23 weeks of age — some even earlier. All McMurray Hatchery started pullets are farm-raised with free access to pasture for foraging. Also referred to as the Dominiker, this distinctly American breed is a hardy additional to your backyard flock. These Delaware started pullets are mostly white with black barring on their neck and tail feathers. They're a medium sized docile bird weighing 5 1/2 pounds at maturity and usually start laying large brown eggs at about 24 weeks. Delawares are becoming a relatively rare heritage breed among poultry raisers making availability limited. Developed in Sussex County, Englan over 100 years ago, the distinctive pattern enabled the Speckled Sussex to blend into the bushes and thus hide from predators. It will be hard to keep their beauty hidden if you add them to your backyard flock. The Australorps have a solid black plumage with a beautiful green sheen, when standing in the sun. They are one of the most prolific egg producers of brown eggs. At maturity the females weigh 6# and start laying at approximately 24 weeks.